Probably the most frustrating thing for programmers - aside from trying to understand someone else's undocumented code - is spending hours and hours on completing a truly elegant piece of work, publishing it, and then having someone come along and simply steal all your carefully crafted code. Intellectual property theft is an incredibly important and all too widespread problem, and numerous solutions have been developed to handle it. The most effective way, however, is to encrypt your PHP code, rendering it completely incomprehensible to someone hoping to steal your intellectual property, but maintaining its ability to run flawlessly. We'll look at a couple of the different encryption options to help you decide the best way to go. First and foremost, we should discuss the open source possibilities. There are two main packages, Turck MMCache and PHP Obfuscator, both of which are free - but they come along with all the pitfalls of open source software, including bad documentation and no support structure. If you're running an extremely valuable piece of code that you've just poured weeks or months of work into, you shouldn't trust it to an encoder that doesn't have a support system. While open source might be fine for small pet projects, any serious encrypting solution should have support staff on hand to handle any questions or concerns when it comes to integration and implementation, so that you can focus on the work you're being paid to do. If you're a serious developer who regularly creates work that is valuable enough to encrypt, it's easy to see which is the better - and more economical - choice when it comes to protecting your intellectual property. 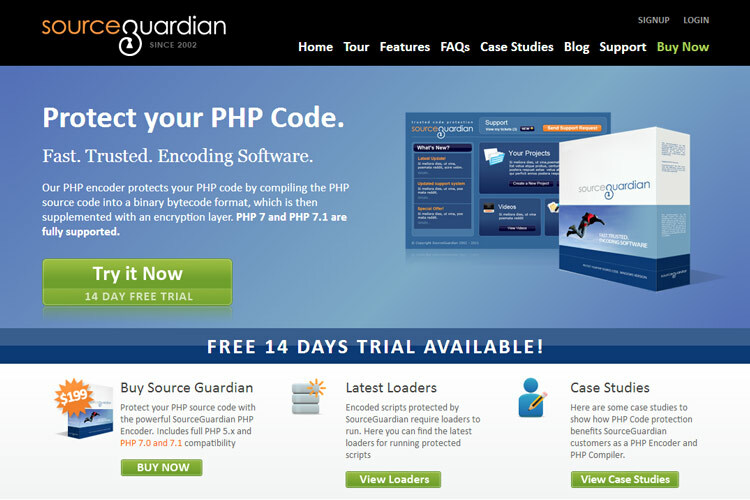 Try a 14 day free trial of SourceGuardian today!